This is the first blog post after quite a while and we're happy to be back! The development period is largely over and we can start discussing how VersionPress will be available in 2015, what to expect from future releases, when to expect them, etc. To get a little bit of context, let's briefly recap what has happened up until now. VersionPress started as an internal project sometime in 2012–2013. We knew that proper version control for WordPress would be an amazing thing to have but none of us really believed it could be done, at least not in the idealistic form we got in our heads. But programmers are curious creatures and we simply took it as a challenge. And, somewhat surprisingly back then for us, we were able to slowly solve one major problem after another and eventually had a working prototype. At the beginning of 2014, we were confident enough that VersionPress could be done. At the same time, we realized that finishing it will not be easy. The prototype worked in basic scenarios but there were many edge cases, we didn't know how we're going to support 3rd party plugins, how we'll run on shared hosts, etc. 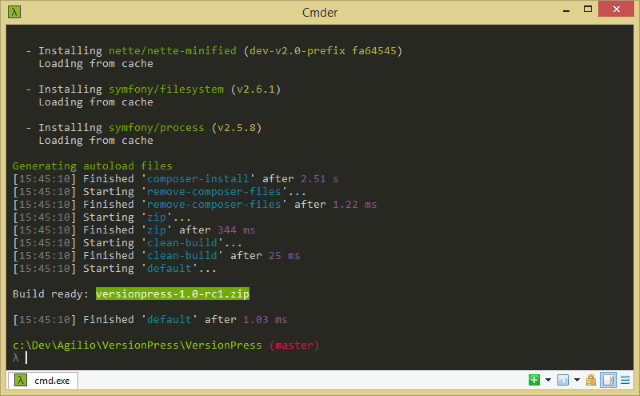 What does it even mean for a project like VersionPress to be “finished”? We'll need to be adapting for new WordPress APIs, new plugins, themes etc. The task seemed huge. At that time, we realized that we would need to convert this into a full-time project and tried our luck in a crowd-funding campaign run in June 2014. We didn't quite reach our funding goal but the response was so overwhelming that we decided to push forward. In the following months, VersionPress made a lot of progress that our campaign backers were informed about via emails. We shipped a couple of prerelease versions (alpha1, alpha2, alpha3, beta1 and beta2), prepared the docs site, set up this new blog with VersionPress already running it and done a couple of infrastructure things like preparing for the EU VAT law changes in 2015. It has been a busy few months. Now in January 2015, we are close to releasing VersionPress 1.0. Later this week, a release candidate will go out to our crowd-funding backers and if no major issues are found, VersionPress 1.0 will be available later this month. Version 1.0 will contain all the important basics – things like Undo, Rollback, automatic change tracking, support for all the built-in WordPress types, etc. Version 2.0 will bring full support for sync and staging. We have done some significant work on it already but 1.0 can go out quite happily without it so we don't want to delay it any further. Versions 3.0, 4.0 etc. will bring features from our roadmap. No specifics are announced as yet. With every future release, we will also be improving compatibility with 3rd party plugins, hosts etc., and we also have a couple of surprises up our sleeves. We will also be closely watching the needs of our users and prioritize based on that. This program will be running for at least half a year, meaning 2-3 major versions at least. Anyone can join and new versions will automatically be available to all program members as they are released. In a sense, there is no need to wait for a particular release; if you like the project you can join it now and future releases will be automatically available to you. The EAP badge is here to set the right expectations. 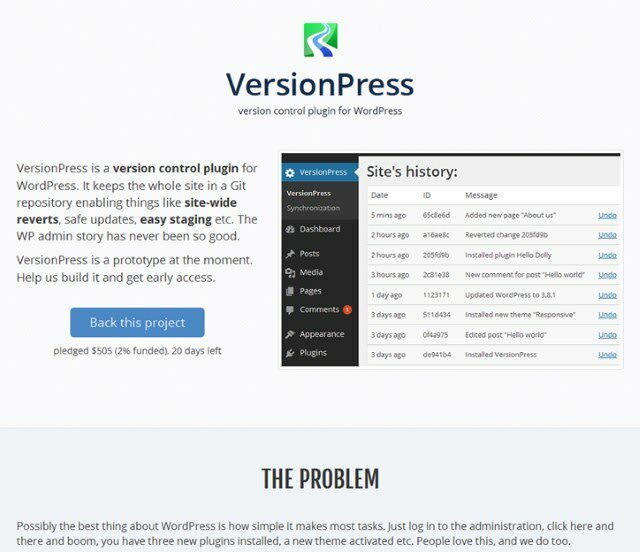 Although stable versions are well-tested and work fine in the supported scenarios, we want to make it clear that VersionPress is still a young project and some hosts, 3rd party plugins or scenarios might not be fully supported. EAP is a way for us to help fund the development. The parameters are very similar to the last year's crowd-funding campaign so hopefully it is a fair deal for WordPress community and its members. EAP is an important step in the life of VersionPress and hopefully it is a good balance between making it accessible to anyone interested and obtaining funds for future development. Big thanks if you decide to support the project this way. VersionPress will be available through the Early Access Program that anyone can join here. New releases will be available to EAP members automatically. If you have any questions, please leave a comment and we'll be happy to reply.